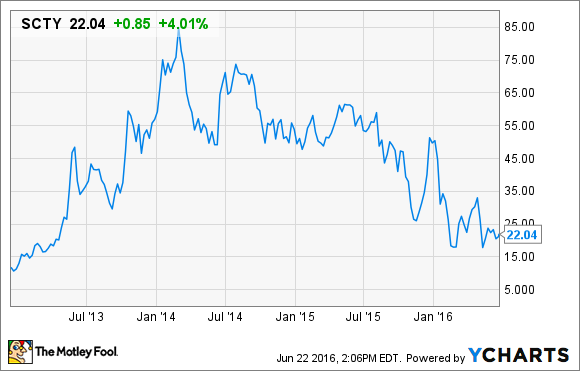 Tesla Motors Buying SolarCity Corp: Smart Move or a Complicated Disaster in the Making? Elon Musk thinks big. But will combining two quite different companies really be a winning approach? Elon Musk thinks EVs and solar systems belong together. Image source: Tesla Motors. Late in the afternoon of Tuesday, June 21, the market was greeted with the bombshell news that Tesla Motors (NASDAQ:TSLA) had made an offer to buy SolarCity Corp (NASDAQ:SCTY.DL). And while there's no doubt this is a big, aggressive move for Tesla, the question is whether or not the combination of SolarCity and Tesla Motors really makes sense. As of this writing, the market doesn't seem to be enamored with this deal. Tesla Motors shares are down over 9% at this writing on June 22. Based on the exchange ratio in Tesla's offer, that puts SolarCity's stock value between $24.40 and $26.20, since it's now basically pegged to Tesla's share price. TSLA Net Income (TTM) data by YCharts. Powerwall (battery storage) sales would be lower-cost from a combined company. SolarCity's customer-facing presence would immediately increase through Tesla Motors stores. 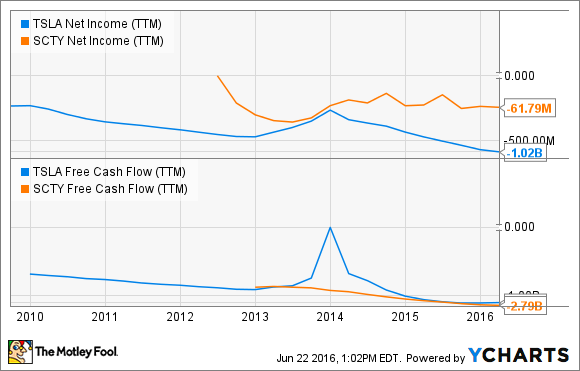 SolarCity is on track to be cash flow positive "within six months at the outside." Image source: SolarCity investor presentation. As you can see, SolarCity's sales cost per watt was up substantially last quarter, due to increased fixed costs, but lower sequential volumes. Before the acquisition offer was announced, SolarCity management said its volume would grow at a higher rate than its sales expense most quarters going forward, and it's highly likely that this acquisition would help that happen. The positive cash flows that SolarCity is on track to produce shouldn't be ignored, either; this is far from a move to "save" SolarCity, as some in the financial industry have posited. SolarCity's revenues are largely tied to long-term (as in 20-year) contracts with its solar-system customers. And that cash flow could do a lot to help underpin the financial strength of Tesla, which continues to spend gobs of cash to build its battery factory and increase manufacturing capacity ahead of the 2018 launch of the Model 3. Legendary investor Peter Lynch wrote about "diworsification" in One Up on Wall Street, describing the often failed marriages of disparate businesses into corporate conglomerates. As often as not, the expected cost savings and "corporate synergies" fail to materialize. That's clearly one big risk for this merger. If the combined sales organizations don't lead to lower sales costs -- or higher rates of sales growth -- for SolarCity, then there's not a lot to gain for that company. Despite the way the market is reacting today, this deal is probably better for Tesla Motors shareholders than it is for SolarCity shareholders. Barring a significant benefit in lower sales costs and better sales growth, it's hard to see how this makes SolarCity better than it would be as a stand-alone company. Another risk is that both companies are likely to require substantial outside cash in coming years. So far, SolarCity has shown it can use its solar assets to access relatively low-cost capital, and over time its growing cash flows should reduce its need for outside cash. At the same time, Tesla has found the market relatively receptive to secondary share offerings to raise cash to pay for capital expenditures. But if capital markets tighten up before Tesla's big capital projects are complete, or before SolarCity's cash flows are substantial enough to reduce its reliance on financing to pay for growth, a combined company could face twice the impact as two stand-alone ones. This is especially true for what will become a much more complex business that could make lenders more wary. When a company depends on outside capital, this risk cannot be discounted or ignored. While on the surface the marriage of a solar company and a carmaker doesn't make a lot of sense, there are probably more "synergies" than are at first apparent. The companies target similar customers, so it's likely that SolarCity will realize lower sales costs, and maybe even see accelerated sales growth with a better retail presence. At the same time, Tesla's manufacturing experience could help SolarCity move forward with its Silevo panel-making business. Put it all together, and I expect this deal -- assuming it actually closes -- will work out fine. Admittedly I don't like it as a SolarCity investor (and want to see a better offer), but as a Tesla shareholder I think it will make for a stronger company -- even if all of the potential benefits aren't realized.